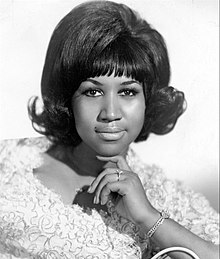 Aretha Louise Franklin, ki fèt sou 25 mas 1942 nan Memphis (Tenèsi) epi ki mouri sou 16 out 2018 nan Detroit (Michigàn), se yon chantèz otè-konpozitè ameriken nan gospel, soul, funk, rhythm and blues ak djaz, e mizisyèn (pyanis) rele "The Queen of soul" oubyen ankò "Lady Soul". 1985 : Who's Zoomin' Who? Paj sa edite a 14:19, 9 septanm 2018.